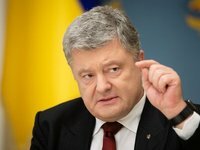 Ukrainian President Petro Poroshenko expects to hold debates with his rival in the presidential election campaign, Volodymyr Zelensky, both on April 14 and 19, Artur Herasymov, leader of the Petro Poroshenko Bloc parliamentary faction, said on Monday. "I'll say on behalf of our faction that we expect to receive answers to all key issues concerning Ukrainian society at debates between the presidential candidates very soon. Petro Poroshenko is waiting for Zelensky to appear for de facto debates - I'll stress, de facto debates - both on April 14 and 19, by the way. As they say: if it's a stadium they want, a stadium they'll get," Herasymov said at a meeting of the conciliatory council of the leaders of private parliamentary factions in Kyiv on Monday. Zelensky said earlier that his debates with Poroshenko would take place at the Olympiyskiy National Sports Complex on April 19. Poroshenko said in a live interview shown on the 'Ukraina' television channel on April 7 that he expected Zelensky to turn up at the Olympiyskiy stadium on April 14 to take part in debates before the second round of the presidential election.